Technology is changing how we do everything, including how we buy and sell homes. For example, much like how robo-advisors are using software to democratize investing, platforms like Opendoor allow people to immediately get offers on their houses, instead of going through the regular rigamarole. In June 2018, Opendoor announced that they had raised $325 million in new funding, bringing the business to a valuation of $2 billion. That’s a pretty big deal in the real estate and fintech space. However, no matter how bullish iBuyers are, the product category faces a big challenge: getting the average homeowner to know what iBuyers even are. Even in 2018, selling your home online sounds suspect to a lot of people. In order to get more and more folks buying and selling homes online, Opendoor (and iBuyers in general) have a lot of educating to do. My friend Nate Smoyer at Real Team Panda and I were curious about how Opendoor is educating the average Web surfer. So we teamed up to write a teardown of Opendoor’s content marketing. In addition to running a growth marketing agency, Smoyer’s a real estate agent—so he has a lot of thoughts on companies like Opendoor. First off: what does Opendoor do? Just in case you’re not familiar with Opendoor, here’s a quick video overview of what they’re all about. In our opinions, they do a pretty great job of summing up why iBuyers exist. What kind of content does Opendoor produce? But beyond this, they’ve started investing in content marketing—that is, growing and engaging their audience by making Free Helpful Stuff. You’ll find most of this content on the Opendoor blog, with the exception of a few free tools for people looking to sell their homes. Long story short: Opendoor has made some investments in content over the past year—but there’s a lot of room for improvement. Key Strength: Lots of cash to spend on content and promotion, which can make a flywheel as they enter new housing markets. Key Opportunity: They have a strong product offering—lots of people have questions about the difficult process of buying a home. Opendoor can answer these questions, and provide one of the easiest next steps possible. Key Weakness: They don’t have a strong suite of content yet. Key Threat: Their new competitors (especially Zillow) boast a great deal of content that is already bringing in highly valuable organic traffic. The competitors have the attention, and by offering iBuyer options of their own, they can turn that attention into business for themselves—instead of business for Opendoor. Where will (or should) Opendoor go from here? Opendoor has a lot of cash on hand right now, and I imagine most of that money is going to go toward further developing their product, entering new housing markets, and building relationships with complementary players in real estate. But at least some of that cash needs to go toward combating a new competitor in the ibuyer space: the SEO juggernaut Zillow. In spring of 2018 Zillow launched Instant Offers, which means now everyone’s favorite omni-list of properties is willing buy and sell yours. Why does Opendoor need to fight Zillow? Because when it comes to search traffic, Zillow’s already getting far, far more attention from homeowners and homebuyers than Opendoor. The Opendoor blog gets about 2,300 hits from organic search every month, and Ahrefs values that traffic at about $6,400. Meanwhile, Zillow gets more than 270,000 monthly organic visits, and if you were to pay for that traffic in PPC, you’d have to shell out $460,000 a month. And that’s not even counting the organic traffic that they bring in via Trulia (which Zillow acquired in 2014). So … what should they do? Trulia (owned by Zillow) has a great deal of blog content, but one section of their blog in particular is growing quickly: their guides. And they’re pulling in the traffic for them, too. 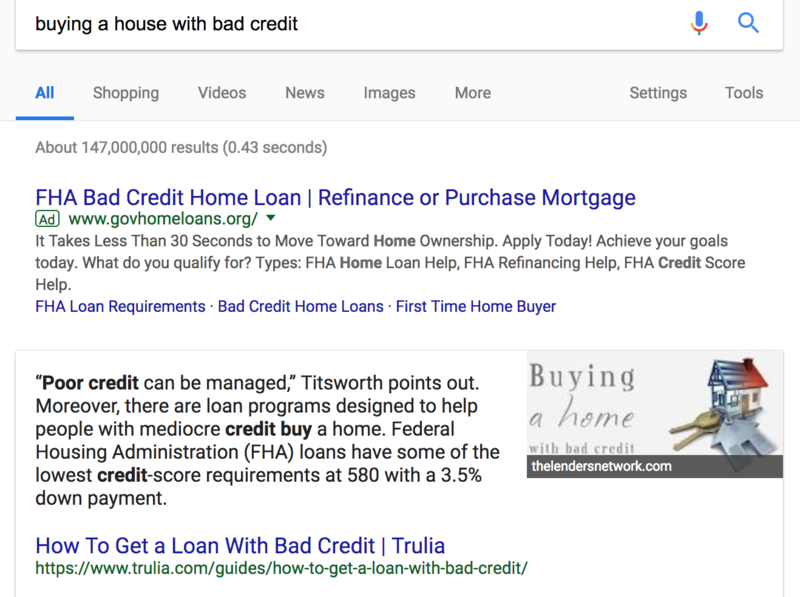 As I write this, the search query “buying a house with bad credit” pulls up a featured snippet from Tulia’s guide on getting a loan with bad credit. The guides section of Trulia’s site gets more than 55,000 organic hits every month—hits from people who specifically want to know more about buying, renting, and selling homes. Trulia has about 70 guides on their site right now—but other iBuyers needn’t write 70 of their own. Trulia’s top 20 guides are pulling in 90% of the traffic. Any iBuyer with a smart content strategist could zero in on Trulia’s best content, write better guides, and promote them in order to get in on some of this organic action. Opendoor’s blog features several customer stories, but these stories tend to live as standalone blog posts. They don’t come up prominently in Opendoor’s other posts—which means Opendoor is leaving a lot of potential credibility on the table. Right now, the primary call to action at the end of an Opendoor blog post is to use the app, either by looking for homes or getting an offer. However, there’s not a lot of fanfare for the customers that have already experienced success on the Opendoor platform. If I were on Opendoor’s marketing team, I would identify a few golden customer success stories and create some in-content “ads” highlighting these stories. They might be images in the sidebar. They might be text call-outs in the article. They might just be the primary call to action at the bottom of some posts. 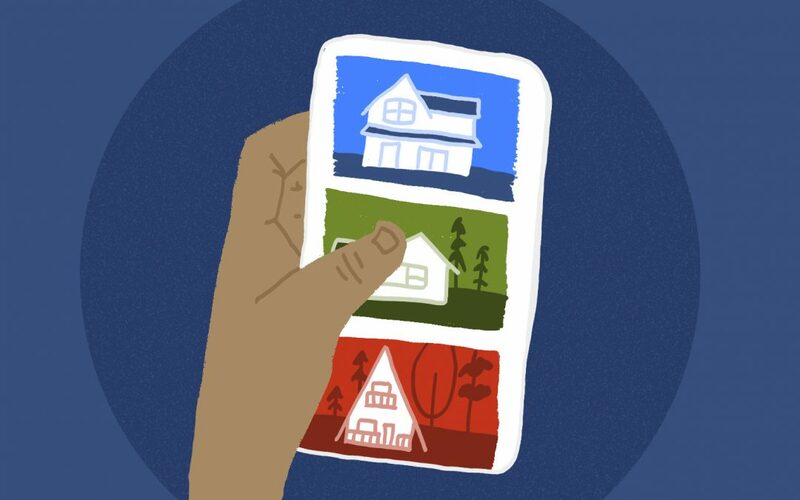 It would be smart for Opendoor to showcase their user stories in their own content as a next step—especially for people who are arriving at this website for the first time from a Google search. One of the biggest challenges the iBuyer category faces is getting people to trust and understand their business model. Seeing real people with real stories will go a long way. Right now, Opendoor’s blog is a slush pool of content. Some of these articles are for people looking for a home, some are for people hoping to sell, some are for real estate agents, and some are just for people who want to know more about Opendoor. That’s not the best experience for a user. People who want to sell their home don’t necessarily need to read about tips for buying a home with kids. Plus, Opendoor’s blog lays out their most recent posts first, which means a lot of relevant evergreen content is buried below the fold. A logical move for Opendoor would be to arrange their content more like a library and less like a traditional blog. People who want to buy a home shouldn’t have to hunt for relevant content—they should be able to quickly filter out irrelevant content. This isn’t a huge issue for Opendoor right now, because most of their recent content is in the Home Selling category. But as they ramp up on evergreen content (which they should), they will need to organize that content around the readers’ intent. Opendoor is set up for success—and has a big, big bag of cash to help them get it. For their sake, I hope they make some aggressive content and SEO grabs soon.